Gorakhpur deaths- addressing an unfolding tragedy. If all the suspects are declared innocent, the responsibility for whatever happens must lie with the victims, for victims are the only certainties in any case. Zahid Ali of village Bichhiya thus narrated the incident of his five year old daughter, Khushi. She ran high fever and was taken to a nearby doctor. Next day, the girl started vomiting and trembling. Then she was brought to the medical college hospital on the night of August 10. Zahid stated that the atmosphere at the ward was of utter confusion. Everybody was running here and there. The attending nurse gave him an AMBU bag – a device which supplies oxygen to patients temporarily. He saw every attendant giving oxygen to their patients with the help of AMBU bag, as the piped supply of oxygen had stopped in the ward. Zahid too tried his best to pump oxygen from AMBU bag to Khushi. However, his daughter could not be saved, and she died in the evening of August 11. Similar is the story of Israwati of village Belwara. Her grandson was born on Rakshabandhan day. Her two granddaughters tied rakhi to their new born brother. The next day, the baby started crying, and ran high fever. He was taken first to a private clinic, and then to the medical college hospital. The family was also provided with AMBU bag there. On August 11, around 5 pm, the baby vomited blood, and his body became cold. The four-day old baby had expired. Israwati stated that a number of newly born babies also met the same fate in the ward. Brahm Dev Yadav of Baga Gadhra, a farmer by profession, had a similar experience. On August 1, his wife delivered twins – a boy and a girl. Everybody in the home was very happy. On August 3, the twins fell ill. They were taken to a local doctor. After two days, the doctor asked Brahm Dev to take the babies to the medical college hospital as their condition had deteriorated. Brahm Dev informed that the meter installed at the pipeline supplying oxygen in the hospital was showing the pressure as LOW during the days prior to August 10. He was also provided with AMBU bag during the night of August 10. He, along with his wife, kept on operating the device to supply oxygen to both of the kids. However, the baby boy expired on 11th noon. As he came back after disposing off the body of his son, his daughter also expired the same day. These are some of the heartrending tales that emerged when talking to the families visited by an AIDWA delegation in the aftermath of the Gorakhpur tragedy. In less than 48 hours on August 10-11, it is estimated that as many as 34 children and 19 adults died in the hospital. The sudden crisis was linked to the lack of supply of life saving oxygen to the gasping patients. It sparked off a nation wide outrage which has served to throw light on the dismal state of affairs in one of the leading public hospitals of UP, and the acute failure of the health system to address the surge of deaths being caused by encephalitis, and other chronic diseases that are widespread in this region. It is a shocking reality that even as India was getting ready to celebrate her 70th Independence day amidst much fanfare, dozens of children died on that fateful night at the BRD Medical College Hospital located in the UP Chief Minister’s own backyard. There have been recriminations, protests, suspensions, and dismissals. But was this a one time tragedy? Unfortunately, the answer is a resounding ‘no”.. Neither the Adityanath Govt of UP, nor the Modi Govt at the Centre should be permitted to get away with a crime that is as much, or even more due to the current health policy directions adopted by the BJP, as the negligence and apathy of the hospital administration. The CM can hardly claim to be ignorant of the problem. He has been representing Gorakhpur Lok Sabha seat in parliament for almost two decades. But no concrete steps have been taken to combat the menace.. There cannot be closure to this situation until the varied reasons that led to the multiple deaths are understood and addressed comprehensively Coming to terms with an ongoing crisis. The specific instance of the deaths that occurred in Gorakhpur is particularly appalling because of the normalcy with which it is accepted as a seasonal phenomenon! The administration and the political representatives did not cringe while pointing out that such deaths have been taking place every year, and in fact, the rates are even higher at certain periods. The health minister Siddharth Nath Singh shamelessly made a statement that 500 to 600 deaths occur during the month of August every year in and around Gorakhpur. One article mentioned that on September 4th, 2016, 224 children were reported to have died of encephalitis in the hospital, but there had been no public response and it did not make the national headlines either! It is a matter of great concern that those in power have got inured to the tragedy that is being repeated year after year. Public outrage has forced a reckoning this year, but continued attention to addressing the root causes of this ongoing tragedy is imperative if the situation has to improve on the ground. What ails BRD Medical College Hospital? Founded in 1969, the reputed 900-bed BRD hospital caters to a population of over five crore from 15 districts of Eastern UP, 10 districts of Bihar and bordering Nepal. Gorakhpur and nearby districts of Maharajganj, Kushinagar, Deoria, Basti, Azamgarh, Ballia have been prone to attack of encephalitis virus for decades. The hospital has a 100-bed Special Encephalitis Ward, a Neonatal Intensive Care Unit, an Intensive Care Unit and an Isolation Ward to treat infants suffering from encephalitis. Ward no. 100 of the BRD Medical College Hospital, with 54 beds has been set up for treatment of encephalitis patients. Another ward having 44 beds is meant for new borns. Though it is a tertiary care centre, the hospital is terribly overcrowded, and is hard pressed to provide facilities for the patients admitted there. The infrastructure facilities at the hospital are very insufficient to cope with the requirement. Three to four sick children are being accommodated on one bed. Employees and nurses are working on contract basis, that too without getting salary for months together. Even doctors are working on contract, they also get their salary after four-five months. Adequate number of ventilators and warmers are not available. Funds are not made available on regular basis resulting into recurring crisis of one or the other kind. There are piles of garbage near the paediatric ward, the drains are clogged, the holy cows may be found roaming the campus, with cow dung getting cleared only before VIP visits- these are a sample of the hugely unsanitary conditions prevailing there. The current series of deaths which jolted the conscience of the nation can be traced to the lack of adequate oxygen supply. The wards are supplied with oxygen from a liquid oxygen plant through a pipeline. There was a disruption in the supply because Pushpa Sale Agency, which supplies oxygen to this hospital, had not been paid for the last five months to the tune of Rs 65 lakhs. The firm had taken up the matter with the concerned authorities several times, and had made it clear that they could not go on supplying oxygen for an indefinite period. But the authorities did not pay heed to their complaint. At the time of the incident, as against 400 cylinders, there were only 50 oxygen cylinders available. While it is true that oxygen is an end stage management, the lack of oxygen did play a contributory role, and hastened death in many cases. Why was the agency not paid on time? Clearly, there was an expectation of a cut from some quarters, pointing to a corruption nexus operating at the hospital. Rent seeking for various services has become a bane, and is affecting the system from top to bottom. These routes for corruption are well laid, and often stretch right up to the Minister’s pockets. A major source of corruption is the procurement of drugs and equipment, like the oxygen supply. There should actually be a 3 month back up supply of oxygen and other life saving equipments in the hospital. At least a minimum of one month supply is a must. Moreover, the procurement of these items must be done in a transparent manner, adopting systems which are in place in states like Kerala and tamil nadu. This is one important step needed to ameliorate the situation, but it is not adequate in itself. Though the region has been plagued by various forms of encephalitis, including Acute Encephalitis Syndrome, ( AES ), Japanese Encephalitis ( J E), and other diseases like scrub typhus, the causes underlying the outbreaks of disease are still not entirely known. AES is an inflammation of the brain which is most often caused by contaminated food or water, besides mosquito bites. It mainly affects malnourished children, but occurs among adults also. It can cause headaches, seizures, fever, brain damage, or coma, depending on the seriousness of the attack. Around 30% of those affected make a full recovery, of the rest, half of them die, while the other half survive but suffer from serious mental retardation or paralysis of one or more limbs. Patients often require assistance to breathe. Doctors at the hospital say they have been treating patients for symptoms, without really knowing the cause of illness. Quoting the words of a senior doctor at the hospital : "AES can be caused by any of several viruses, bacteria and fungi. The term AES is a convenient label for symptoms, a surveillance tool for a host of illnesses such as scrub typhus, dengue, Japanese encephalitis (JE), pneumonia, mumps and measles. For 50 per cent of patients, there is no real diagnosis." All these illnesses require different approaches. For example, JE is caused by a virus found in pigs, water birds and livestock. It is transmitted to humans by mosquitoes. Scrub typhus is caused by a bacterium transmitted by a microscopic mite found in scrub vegetation, common in Gorakhpur. 40 to 60% of deaths are caused by scrub typhus, a disease which responds to antibiotic treatment especially with early diagnosis. On April 27, the Union Ministry of Health and Family Welfare wrote to UP Health Minister that Scrub Typhus is very easy to diagnose in laboratories with a simple test, and that the condition is fully treatable if diagnosed early. Till date, no health centre of district hospital has been equipped for Scrub Typhus tests. The Indian Council of Medical Research (ICMR) officials took stock of the situation in July. It informed the UP Govt. that Scrub Typhus is a reversible condition, but not after the patient has slipped into multi-organ failure. Early care at grassroots is a must, for which basic antibiotics Doxicyclin and Azithromycin should be made available. "It is worthwhile to treat even suspected cases with these drugs to save thousands of lives with timely intervention," the ICMR said. The ICMR Director General pointed out that there would have been no need for patients to travel long distances and come to the district-level centre, if mechanisms to tackle Scrub Typhus were put in place in primary and community health centres. In essence, the children who died due to lack of oxygen in Gorakhpur would not have been admitted to the tertiary-level hospital, had timely care and attention been provided to them at primary health centres or by village health workers. But what is the current condition of the PHCs, CHCs, and district hospitals in the state? The district has a 37 per cent shortage of health sub-centres. Only 45 per cent of villages have access to a sub-centre within five kilometres. It's often too late when patients reach the hospital. In an interview given some months back, the Health Minister himself acknowledged that the health system was in the ICU. There are 529 PHCs – less than half the number needed for a population of 4.5 million. Each PHC has only one ANM with a multi purpose worker, whereas there ought to be 2 ANMs per 5000 population. When compared to Kerala or Tamil nadu, UP has one sixth the staff whereas their needs are much more than in these states. The CHC was supposed to be equipped with a 4 bed new born care unit for every 2 lakh population. This has not happened. Nor are the district hospitals provided with an NICU to cater to a 20 lakh population as envisaged. Is it any surprise that the BRD hospital is getting inundated with patients, many of them coming in almost too late to be given successful medical treatment? Added to this is the delay caused by the overwhelming presence of quacks, who provide the first level care in 70% of cases. They guess at the cause, and administer costly drugs which do not cure the patient. By the time the patients are referred to the medical college, their paltry resources are exhausted, and it is often too late for recovery. The private sector when approached provide costly treatment, but in cases where recovery is not possible, and the patients are unable to pay, they promptly refer them to the public hospital. In such a scenario, the role played by the aid agencies, and institutions like the Niti Aayog in recommending private care with Government money is highly suspect. As with the RSBY experience, these private players will be selective in their approach. Their main concern would be to guarantee their own profits, not to ensure that the poorer sections are well taken care of. Hence, it is imperative to strengthen the public systems and make them more effective. How can this be done without allocating the required resources? The budget allocations provide a damaging indictment of the Government policy. The previous Akhilesh Yadav government had in its last budget (2016-17) allocated Rs 15.9 crore for expenditure on health, but the Yogi Adityanath government slashed it to Rs 7.8 crore for 2017-18. Not only this, the present government also cut funds to the hospital for purchase of equipment from Rs 3 crore to a paltry Rs 75 lakh for the current fiscal year. This is like trying to feed an elephant with a grain of rice! There can be no amelioration of the problem unless the state and the centre increases its allocation of funds. To set up more PHCs, improve the facilities at the different levels, make sure that drugs and vaccines are available, doctors and nurses are posted, research is carried out, etc, etc, - the budget allocation has to increase manifold. This is not to mention the attention that needs to be paid to the social determinants of disease. A majority of victims of this deadly disease belong to poorer sections of society. A survey report estimates that 74 per cent of the victims of encephalitis come from families having monthly income of less than Rs 2000.There is wide spread malnutrition amongst them, and there is no provision of protected drinking water. Their locations are unhygienic. The problem will not admit of solution if the high degrees of inequity and exploitation are not addressed. 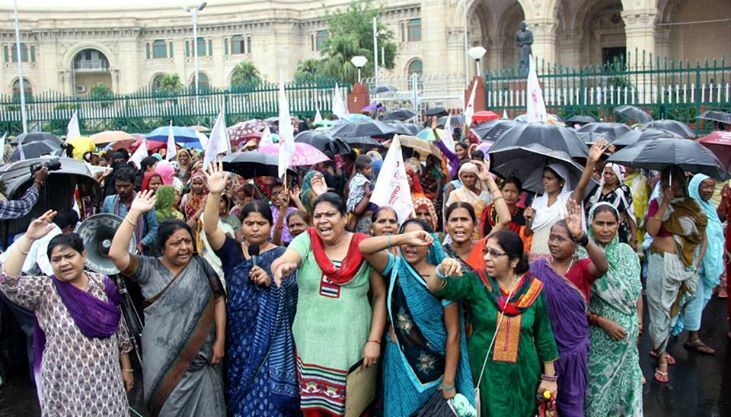 For these reasons, AIDWA has been taking up the issue setting forth both immediate and long term demands. Though the organization is not very strong in UP, there is an active unit in Gorakhpur, which has been leading many protests and agitations. Compensation should be provided to the families of children who died on August 10-11.Penal action should be initiated against the erring officials of administration and hospital authorities who are found to be responsible for tragic death of children due to non availability of oxygen. Health and medical education ministers should tender resignations owning responsibility for the tragic deaths of children. There should be adequate stock of liquid oxygen in the hospital at any point of time. Other life saving medicines and equipments should be available in sufficient quantity. Procurement process of oxygen, medicines and necessary equipments be made transparent. Adequate number of qualified doctors, nurses and other staff should be posted at the hospital on permanent basis. PHCs and CHCs should be equipped with sufficient number of qualified staff, medicines and equipments, so that patients are treated well there itself. 100 per cent vaccination of pregnant women and new born children be ensured. Provision of protected drinking water should be ensured in the surrounding towns and villages. Cleanliness should also be ensured. Clearly, the struggle has to continue. The fight for an improved health system which will lead to a lowering of infant mortality rates is far from over. It has to be fought at many levels- from the echelons of policy making to the roll out of health care facilities at the Primary Health Centres. Such a decline in IMR cannot be achieved in a backward state like UP without the Government, both at the Centre and the state, accepting their accountability for the systemic failure, and providing the resources and support needed to make the system responsive to the health needs of the people, especially the poor. When democracy turns into mobocracy and the mob enjoys impunity and state patronage, we need to resist such attempts with all our might.